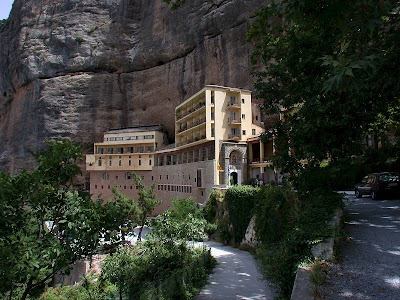 Today (October 18th), besides St. Luke the Evangelist, we also celebrate the feast of three ascetics who founded the Monastery of the Mega Spileon (or the Great Cave) in the Peloponnesus in Greece. I won't be able to relate the entire story, but it centers around finding one of the Holy Icons of Panagia painted by St. Luke. 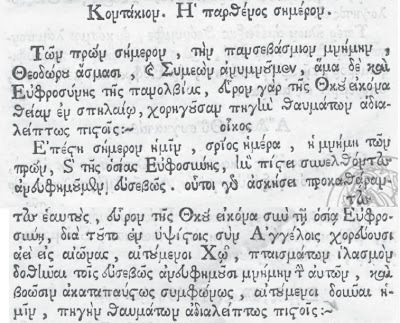 It is summarized and translated from the following two sources: http://www.im-ka.gr/Pages/Mones/MegaSphlaio.htm, http://www.ecclesia.gr/greek/monshrines/megaspilaion2.html. 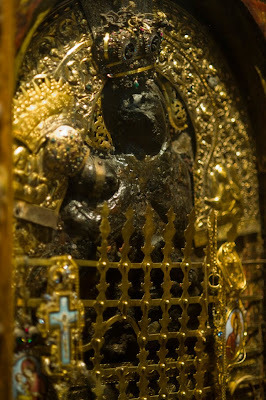 The foundation of the monastery of the Great Cave begins with the wondrous finding the Holy Icon. 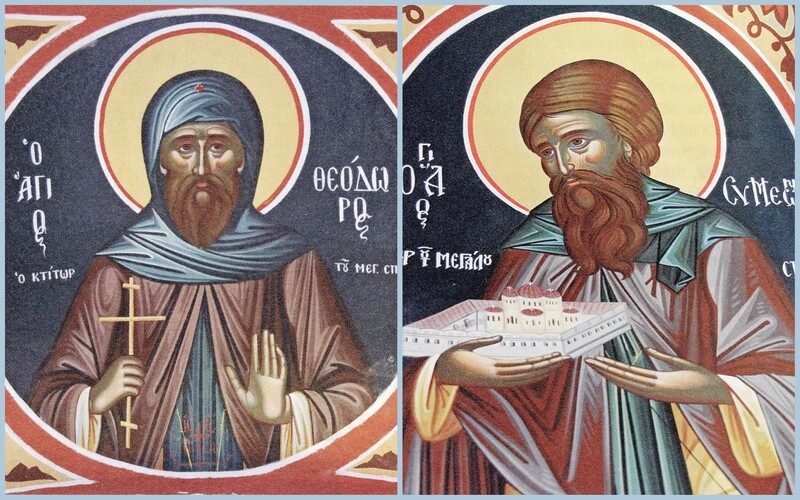 Two brothers from Thessaloniki, Simeon and Theodore, known their for education and piety, after having lived in asceticism in the mountains Olympus, Ossa and Pilio, came to Mount Athos to know hesychastic and enlightened men of the desert. From there they went to the Holy Land to venerate the places where the God-man Jesus Christ walked. In Jerusalem, they were ordained priests by the great bishop Maximos. 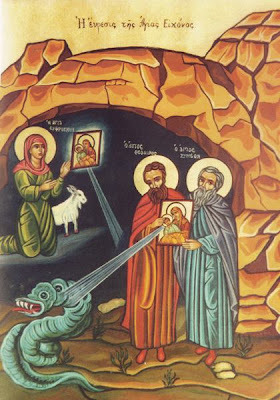 There they each individually saw the same vision and were directed to go to Achaia to find an icon of the Virgin Mary depicted by the divinely-inspired St. Luke. After many wanderings and revealing dreams, they came upon a shepherdess named Euphrosyne (in 362 AD). When they approached, Euphrosyne kneeled to them with respect and called them by their names. 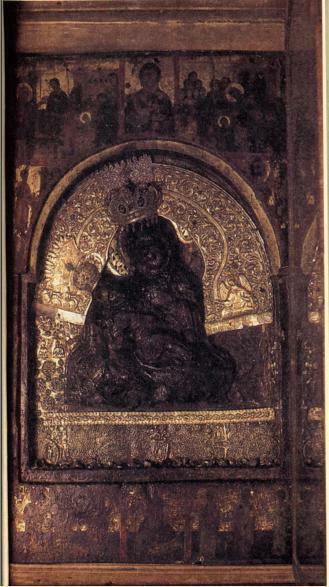 Then she lead them into the cave to the much sought-after Holy Icon, which was discovered just a few years before by her in a wondrous manner. 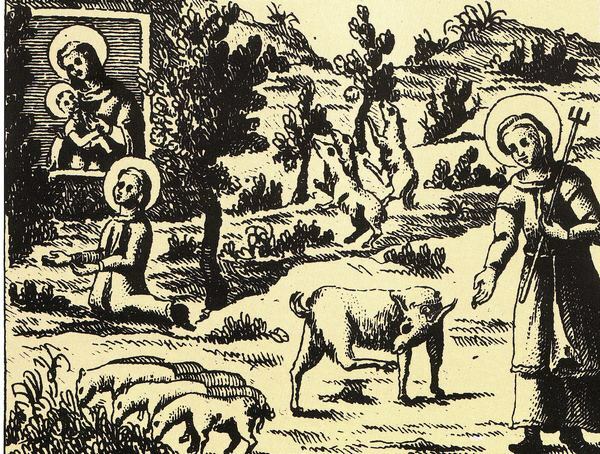 They also found a stone altar that had been carved out of the rock of the mountain by St. Luke and was used by him in the Divine Liturgy, in the place were he lived in asceticism for years. 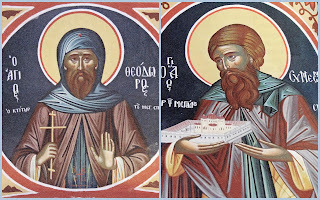 With much joy, gratitude and devotion, the monks Theodore and Simeon took the icon out of the cave and began to clean it. However, a violent dragon soon appeared from the cave, but by the Grace of Christ and Panagia's Holy Icon, it was struck by lightning and died. (The bones of the dragon remain to this day). 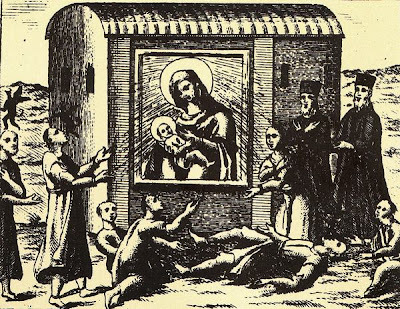 Inside the cave they constructed a small church and some small cells with the assistance of the crowd of believers, who came to venerate the miraculous image of the Virgin Mary and to hear the Word of God from this Godly-preachers, Fathers Simeon and Theodorou. Many of the crowd remained as monastics. So slowly the Monastery became was one of the largest and prestigious beacons of Orthodoxy and a bastion of Hellenism (especially by its aid during the Turkish occupation). 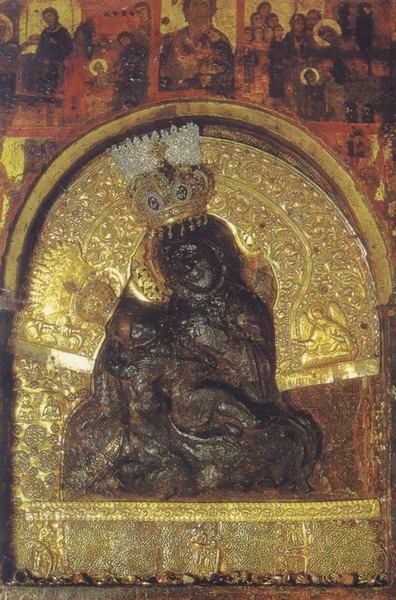 This Holy Icon of Panagia has worked many miracles throughout the centuries, and continues to provide support to the faithful. 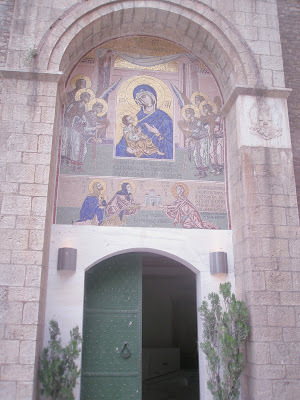 It is made out of mastic and wax using the encaustic technique, and many admit that it fits the time period and location to be actually painted by the hand of the Evangelist. Once the Fathers of the Monastery were asked to bring the Megalospilaiotissa to a village that was suffering. On the way they stopped at another village, and placed the icon in the hollow of a platano tree. Miraculously the icon was imprinted on the wood of the tree after they left, and is still visible and wonderworking to this day. For more information on Panagia Plataniotissa, see: http://www.johnsanidopoulos.com/2009/09/panagia-plataniotissa-sacred-shrines.html. O God of our Fathers, ever dealing with us according to Thy gentleness: take not Thy mercy from us, but by their entreaties guide our life in peace. The image of God, was faithfully preserved in you, O Mother. For you took up the Cross and followed Christ. By Your actions you taught us to look beyond the flesh for it passes, rather to be concerned about the soul which is immortal. Wherefore, O Holy Euphrosyne, your soul rejoices with the angels. The all-venerable memory of the fathers today, Theodore in hymns and Symeon we praise, and that of Euphrosyne the righteous, they found the divine icon of the Theotokos in the cave, and they grant a fountain of miracles endlessly to the faithful. Today has come for us, the day of salvation, the memory of the fathers and of the righteous Euphrosyne, and in faith let us faithfully praise them, for by first purifying themselves by asceticism, they found the icon of the Theotokos with the righteous Euphrosyne, because of this in the highest the Angels ever dance together unto the ages, entreating Christ, that atonement of sins be granted to the faithful who praise their memories, and crying out ceaselessly together, entreating that there be granted unto us, a fountain of miracles endlessly to the faithful. Sts. Theodore, Symeon and Euphrosyne the Righteous, intercede for us!